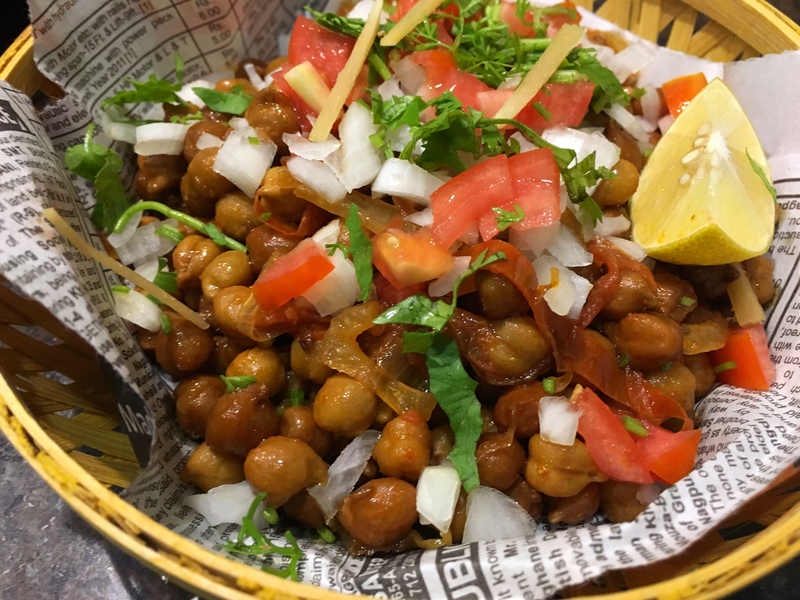 A popular road- side snack chana chaat, is a diabetic friendly recipe. While it can be made with dried white chickpeas (Kabuli chana), you can also make it with dried green chana or dried black chana like I have done. Soak chana in the morning, and then It takes just about 10 minutes to cook when you are ready. This high protein snack is one of the tastiest snacks that can be made in a jiffy. Trust me, a bowl of freshly made chana chaat in the evening is one of the best habits you will inculcate. My recipe does not have potatoes, but you can also add a boiled potato to this chana chaat for a more sumptuous snack. Kala Chana is a variety of Chickpea. Chickpeas are a nutrient-dense food, providing rich content (> 20% of the Daily Value, DV) of protein, dietary fibre, folate, and certain dietary minerals such as iron and phosphorus. Thiamin, vitamin B6, magnesium, and zinc contents are moderate, providing 10-16% of the DV. Chickpeas have a Protein Digestibility Corrected Amino Acid Score of about 0.76, which is higher than many other legumes and cereals. Compared to reference levels established by the United Nations Food and Agricultural Organization and World Health Organization, proteins in cooked and germinated chickpeas are rich in essential amino acids such as lysine, isoleucine, tryptophan, and total aromatic amino acids. A 100-g serving of cooked chickpeas provides 164 kilocalories (690 kJ). Carbohydrates make up 68% of calories, most of which (84%) is starch, followed by total sugars and dietary fibre.Lipid content is 3%, 75% of which is unsaturated fatty acids for which linoleic acid comprises 43% of total fat. Soak chickpeas or Kala chana for about 6-8 hours / overnight. Rinse and remove all water from the chana, keep aside. Heat oil in a nonstick pan. Add cumin and as soon as it crackles add half the chopped onions. Saute till they become golden brown, add turmeric, chili powder, and soaked chana. Add Salt. Cover and cook for 8-10 minutes. Remove and garnish with the remaining chopped onions, tomatoes, ginger julienne, fresh coriander and a dash of lime juice. Is swatis kitchen in Bendigo?? I am interested in learning to cook with chickpeas, lentils, brown rice and all healthy grains, also I have been using coconut oil, turmeric, ginger and other spices as I have as I have had chronic pancretitis for over 2 years and I have been on the candida diet as I was suffering from candida too because of antibiotics and eating too much sugar and yeast which I’ve learnt to change my whole diet but still learning alot about healthy foods and I choose not to eat red meat or processed meat and food if I can avoid it! I’ve been researching so much info about what are antifungal foods, l would like to learn how to make fermented foods with live cultures! I buy sourdough bread and try not to have sugar in my diet! I love chickpeas but I didn’t realize they had so much goodness in them! I would love some recipes using these ingredients and healthy choices for chronic pancreatitis?